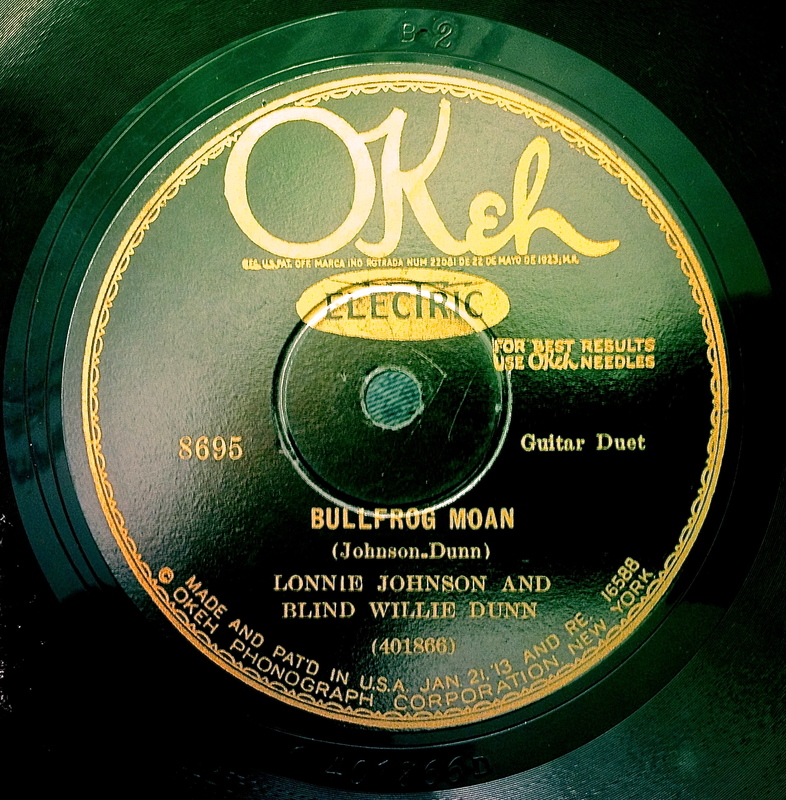 78: “Bullfrog Moan” b/w “A Handful of Riffs” by Lonnie Johnson and Blind Willie Dunn. Okeh 8695. Recorded in New York City, 5/15/29 & 5/08/29. Blind Willie Dunn was actually Eddie Lang, who adopted the name because it sounded “bluesier,” or more “urban,” or, uh, “black.” Eddie was white and was making a good name for himself playing with old schoolmate Joe Venuti when this was recorded. Whether the name change was his idea or that of someone behind the scenes at Okeh Records is unclear, but what is clear is that the record-buying public, in the 1920’s, was unfamiliar—and would be uncomfortable— with black and white performers recording together. Indeed, the songs Eddie Lang and Lonnie Johnson recorded were arguably the very first. As these songs will attest, Lonnie was not a typical blues player. He didn’t think so either; Johnson entered the contest to have a chance to record, even though he thought of himself as more of a jazz player at the time. But the blues label stuck. Fortunately for all of us, Johnson apparently treated that categorical box like a playpen and did whatever he liked within it. On “Bullfrog Moan,” the structure and descending scale of the blues is sweetened with an adept use of the 12 string guitar, its low notes ably suggesting the titular amphibian.